The future of Tarth was bright. Until they came. And the light went out forever. Evernight™ is a very different kind of dark fantasy setting. 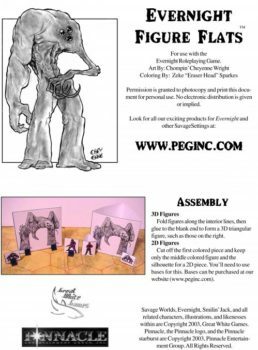 This 144-page PDF book provides a complete scripted campaign, from before the arrival of the mysterious and terrifying Masters to the epic and bloody finish. Player characters start as Novices in a familiar fantasy world of elves, dwarves, orcs, and men. They finish as Heroic adventurers in a land draped in eternal night and overwhelming horror. Evernight contains new Edges & Hindrances, spells, weapons, and magical items. The Game Master has a complete scene by scene campaign ready to run, the truth behind Tarth’s murky past, and a host of new and mysterious monsters! 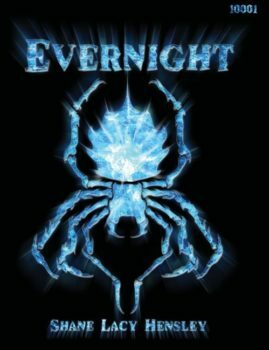 Evernight is out of print, but can be purchased in PDF format right here in our online store.